For Presley, the album’s conciliatory theme grew out of wanting to have peace in her life after a period of turmoil and letting go of what no longer suited her. "There were a few years there where everything around me had fallen apart, she says. All the things that had become my foundation were gone and I had to shed a lot of skin. I found myself really vulnerable afterward and that's what birthed the album’s vibe. It’s me without any attitude or anger at a time of rediscovery." 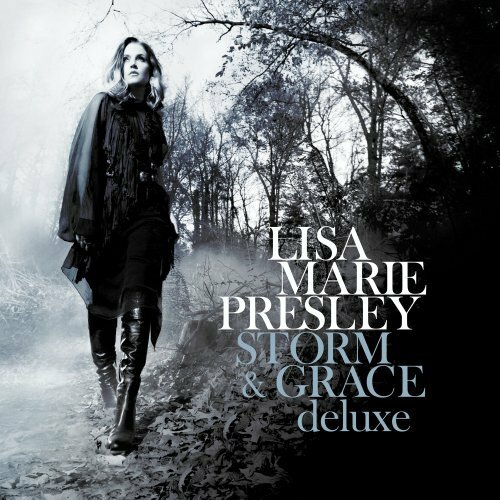 FINALLY, Lisa Marie Presley's (LMP) third album has arrived! It has been a long 7 years since Lisa's second studio offering, Now What, and the wait has been well worth it. Now based in England, a new recording contract with Universal Republic and collaborating with ex Bob Dylan guitarist and now celebrated* producer and songwriter, T-Bone Burnett, Lisa reveals more aspects to her prodigious musical talents, both as a gutsy, emotionally resonant singer and as an expressive and thought provoking songwriter. Lisa's first two albums were ballsy, hard-edged contemporary ballad rockers filled with often painful lyrics as the singer poured her heart out about trials and tribulations from her life. With her new album, Storm & Grace, LMP offers wonderfully constructed songs reflecting her blues and roots musical heritage. All tracks allow Lisa's rich alto vocal to burn resonantly and maintain the driving bass beat and chamber echo effect which embodied her earlier recordings. But Storm & Grace isn’t just a stripped-down “roots” album, with players simply laying down good grooves behind a singer. Thanks immeasurably to producer T Bone Burnett, the musical settings maintain a unified moody tone throughout the 11 songs. The set is full of subdued echo, haunting guitar lines, and the ambiance of a live session trying to capture both the cerebral and emotional elements in each song. Presley’s lyrics balance both the dark and the hopeful, her painful trials and hard-won triumphs, a few hellos and many goodbyes. In other words, storm and grace. Storm & Grace opens with Over Me (click for music video), one of several "poppy" tracks on the album. Its neo-swamp rock intro segues into a pulsating vocal and toe tapping infectiousness. You Ain't Seen Nothin' Yet (the first single from the album - click for music video) continues the pulsating bass beat which characterises many of LMP's recordings (and your toes don't get a rest). Lisa Marie's smoky vocal smoothly traverses the nooks and crannies of what is another "poppy", albeit quite eerie track which will find a welcome spot on the play lists of many radio stations. The strength of the singer's voice is well demonstrated as she soars to high places when singing the song title. Close To The Edge is the longest track on the album, coming in at 5' 13". A slow ballad with less of the deep bass cadence obvious in most other tracks, Lisa Marie carries the listener along with her mesmerising vocal. Storm Of Nails opens with some great toe tapping, guitar twang before settling into a track which goes high and low. Lisa Marie's vocal is reminiscent of Susan Jack's delivery on the very unusual, legendary 1970 track, There's No Blood In Bone, by underrated Canadian group, The Poppy Family. How Do You Fly This Plane is a title you would expect on a Jimmy Buffett album. The very catchy chorus line: Words I Just Can't Say will linger in your head long after the song finishes. A core strength of Storm & Grace is that there is not one track you feel is weaker than the others. The four additional tracks on the deluxe edition of the album are as strong as any of the other 11. I Was Wrong allows Lisa's vocal to wonderfully ebb and flow around lyrics about misguided love. Just A Dream is an exquisitely sung love ballad with Lisa's vocal wafting in almost ethereal fashion. At times throughout the album it can be difficult to comprehend the words in LMP's vocal. However, Storm & Grace is all about music, and the wonderful balance between Lisa's resonant vocal and masterful backing instrumentation, makes each track an aural delight. LMP has chosen a seasoned group of musicians to back her on the album. In addition to producer T-Bone Burnett (guitar), the line-up includes guitarists Jackson Smith, Michael Lockwood (Lisa Marie's husband) and Blake Mills, drummer Jay Bellerose, bassist Dennis Crouch, and keyboard player Keefus Green. The sound they produce is strong, rootsy and engaging. It exudes a quality you only achieve after countless years of experience, proud professionalism and an ongoing love for one's craft. 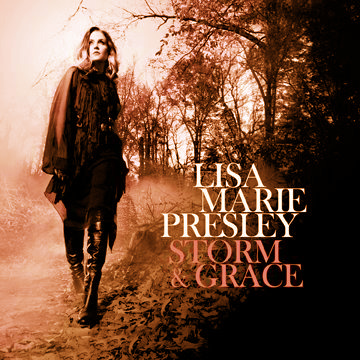 Lisa Marie's skill as an evocative songwriter full of anger, pain and love is reinforced on Storm & Grace. Her ability to express her innermost feelings and experiences both poignantly and forcefully continues to make a statement that will impress fans and critics alike. Interpreting the lyrics on any LMP album is problematic. Lisa Marie is on the record as saying she does not want to reveal the specific drivers behind her songs, preferring to leave it to the listener to form their own view. The songs on Storm & Grace will provide many hours of reflective analysis for keener listeners. Any review of Storm & Grace would be remiss if it did not mention the stunning album cover. 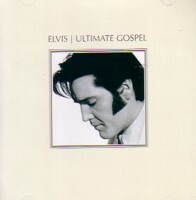 Fully reflecting the quietness (grace) following a storm, it is a moody but serene image with its key protagonist shown off-centre, again symbolising the effects of the contrasting elements in the album title. * T-Bone Burnett has won several Grammy Awards and also an Academy Award for Best Original song, The Weary Kind, featured in the Jeff Bridges film, Crazy Heart. 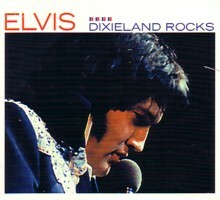 He has produced notable artists including Roy Orbison, Elton John, John Mellencamp and Tony Bennett and k.d. lang.